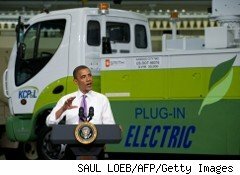 Speaking to employees at the Smith Electric Vehicles plant in Kansas City, Mo., on Thursday, President Barack Obama painted a grim picture of the economy, calling it "as bad an economic situation as we've had since the Great Depression." But he was also quick to tout solid pockets of recovery due to government investment and small-business ingenuity. As part of his reassurance that the economy's on the right track, he pointed to Smith Electric Vehicles, which won a $32 million grant and now employs 50, a number it expects to grow beyond 100 by the end of the year. The company had taken over an empty warehouse, he said. The economy is poised to be the No. 1 issue in this year's election, and Obama is traveling through Missouri and Nevada to discuss his economic policies and raise money for Democratic Senate candidates along the way. On Friday, he'll be in Las Vegas for another economic speech. Republicans call the Obama administration's $862 billion economic stimulus a short-term fix for a much larger problem and say the money never created the jobs that were promised. In his speech Thursday, Obama deflected the blame back to the Republicans. "This recession was a culmination of a decade of irresponsibility -- a decade that felt like a sledgehammer hitting middle-class families," Obama said. "For the better part of 10 years, people have faced stagnant incomes, skyrocketing health care costs, skyrocketing tuition costs, and declining economic security." All that caused a "freefall" that cost 8 million American jobs, he said, adding that when his administration took over, the stock markets were struggling and 750,000 jobs were disappearing every month. Since then, the economy has slowly been rebounding thanks to tax cuts, small business loans and grants, Obama said. While 18 months ago, the U.S. economy was shrinking by 6% a year, it's now growing, with the private sector adding jobs in each of the last six months, he said. "Ultimately, government doesn't create all the jobs," he said. "Government can't guarantee growth by itself. But what government can do is to lay the foundation for small businesses to expand and to thrive...."
The situation's still grim, with five unemployed workers for every job opening. But green-energy companies are expanding and creating a new, sustainable economy, Obama said. Still, he warned that the recovery will take some time. "This has been a difficult time for America right now -- two years of brutal recession, a decade of economic insecurity. And there are going to be some hard days ahead," he said. "That's the truth. It's going to take a while for us to dig ourselves out of this hole."